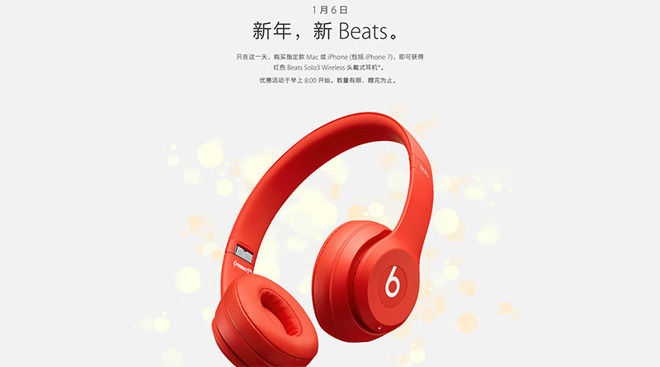 Similar to last year's promotion, Apple's 2017 Chinese New Year sale involves a special edition version of headphones from its subsidiary Beats, in this case the Product (RED) variation. The color red symbolizes good luck and prosperity in many Asian cultures, and is a common sight around the new year. According to Apple's Chinese website, any iMac, MacBook, MacBook Pro (excluding late-2016 models with Touch Bar), MacBook Air, Mac Pro, iPhone 6s, iPhone 6s Plus, iPhone 7 or iPhone 7 Plus will receive an instant credit for a pair of Beats Solo3 hardware. The offer is valid at Apple brick-and-mortar stores or online from 8 a.m. on Jan. 6. Apple has in the past initiated similar sales to woo Asian market customers. In 2014 the company announced a one-day "Red Friday" sales event that garnered shoppers moderate discounts on select merchandise. Identical promotions ran in 2013 and 2012. In addition to the Beats Solo3 giveaway, Apple is showcasing a litany of red themed accessories on its digital storefront, including iPhone cases, audio products, toys and more. The company is also pushing digital wares like Chinese Greetings and Chinese New Year iMessage sticker packs for the seasonal event.